Summary: The only licensed sea turtle treatment facility on the Gulf coast between Sarasota and the Florida Keys, The Clinic for the Rehabilitation of Wildlife, Inc. (CROW) works with these endangered creatures is vital to the life of Southwest Florida coastal waters. On-site diagnostic and treatment options afford CROW the capability of providing the highest quality care all sea turtle patients while at the same time providing day to day operating budget relief for the hospital. CROW will purchase medical equipment to be used with the Tele Pack Vet X endoscope purchased along with a Hopkins Rigid Telescope in 2013. Additional support from the Sea Turtle Grants Program will allow CROW to purchase 9 additional pieces of equipment that, when used in conjunction with the Tele Pack Vet X, will provide the optimum in diagnostics and treatment procedures for ailing sea turtles treated at CROW. 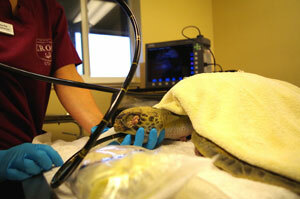 Results: CROW received funding from the Sea Turtle Grants Program for the purchase of an Olympus Flexible Endoscope for diagnosis and treatment of sea turtles. The equipment was purchased in June 2015.